Verax IT Management Suite (ITMS) is a set of pre-integrated, service-oriented applications covering end-to-end IT Management with short turn up times and no integration hassles, enabling IT departments to simplify, automate and reduce costs of IT management. Ensure revenue-generating business service continuity with a complete, pre-integrated 360° IT service management solution. Detect and automate problem resolution in an efficient and timely manner. Consolidate asset management across multiple locations and eliminate resource under-utilization. Design your own business reports, process workflows, SLA levels and dashboards with no programming knowledge required. Service- and business- oriented presentation of information, enabling managers to immediately assess failure impact on provided services and prioritize recovery actions. Simplified and lower cost IT management with a cross-silos, 360° view of IT infrastructure, networks and applications in a single system. Downtime prevention by detecting potential problems before they affect service continuity. Shorter service downtimes: quick problem analysis via event correlations, immediate notifications and automated reactive business logic. Save operational expenses by consolidating asset management across multiple locations. Maximize the value of IT assets by eliminating underutilized resources. 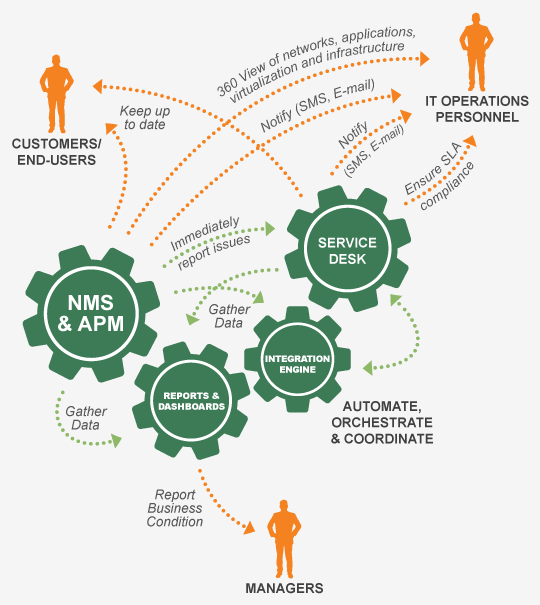 Integrate service support processes across multiple departments. 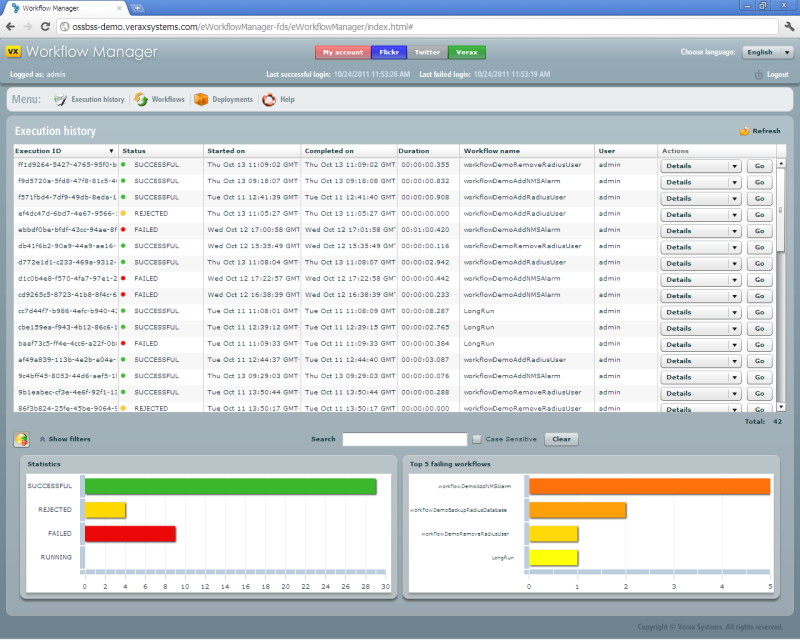 Monitor and report SLA (Service Level Agreements) compliance. 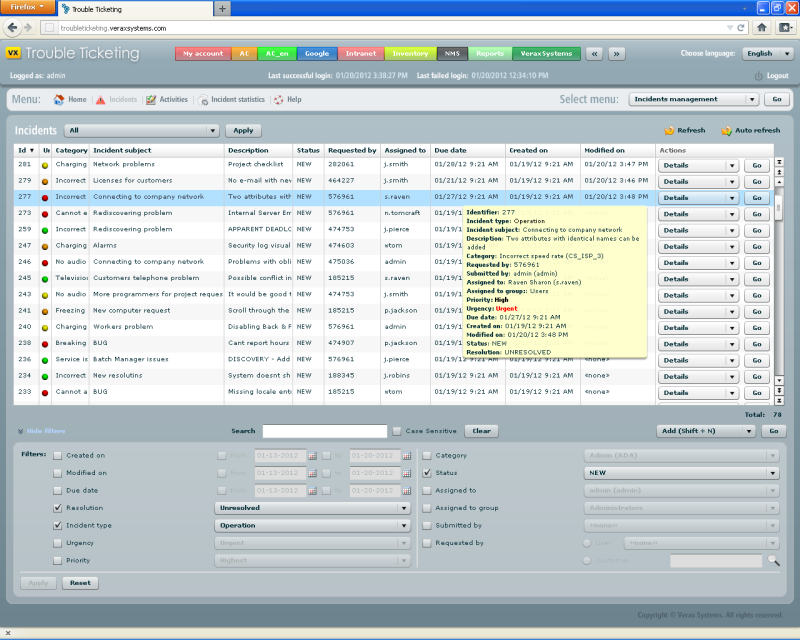 Streamline service desk process and automate incident resolution. 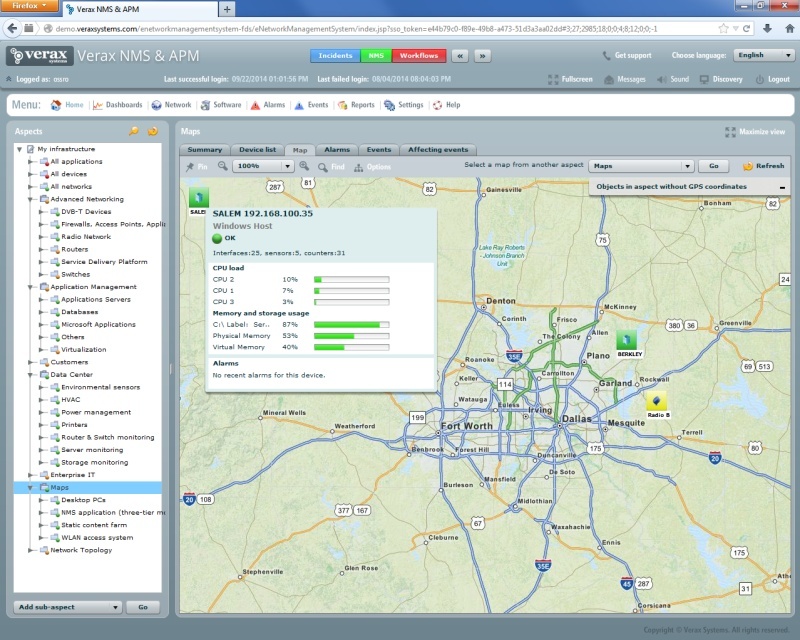 Integrate with Verax NMS & APM and Verax Integration Engine in order to create advanced active asset management, automated infrastructure incident tracking, disaster recovery or provisioning solutions. Verax Integration Engine is a complete BPM (Business Process Management) enabling uniform, manageable and process-oriented integration of IT systems, applications and people. Designed for telco and IT services & applications, the Integration Engine allows service providers and enterprises to tie their applications and services into repeatable, consistent, end-to-end process flows. Interconnect disparate systems using J2EE, XML, Web services and other industry standards. Out-of-the-box integration with Verax applications for building IT automation, disaster recovery, provisioning and other scenarios. Automate business processes for increased efficiency, error reduction and consistent performance. Update business processes easily and enable incremental roll-out according to business needs through GUI-driven versioning, deployment and rollback. Gain better visibility into business process performance through execution tracking and reporting. Ensure centralized, unified management and provide enterprise-grade features, such as: fault tolerance, distributed processing, security, user management, reporting and others. 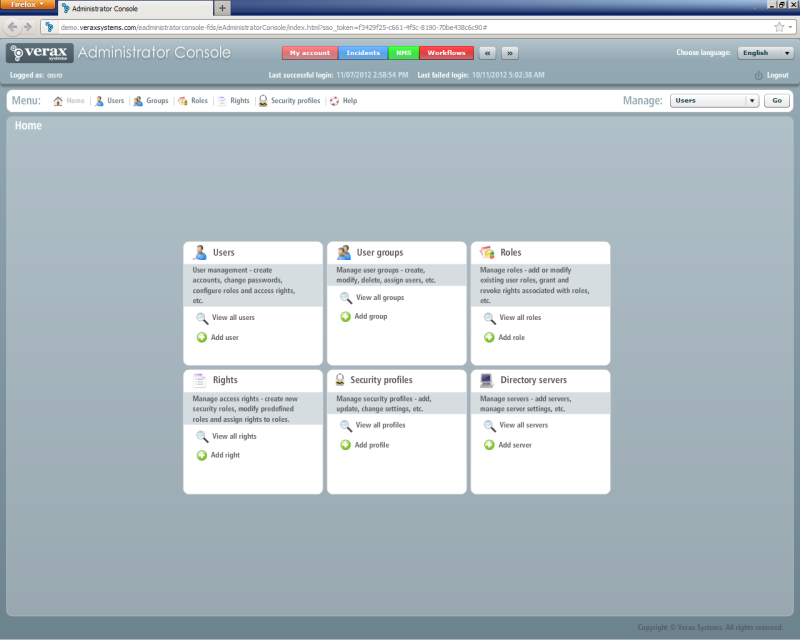 Reduce operating costs via a centralized, unified management console. Ensure business continuity with High Availability configuration. Use hardware resources effectively and avoid investment in high-end servers by distributing processes on a cluster of cost-effective machines. Quickly design and modify business reports to fit business needs using a built-in,cross-application reporting engine and scheduler. 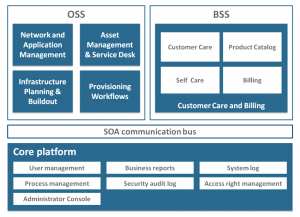 Increase user productivity via the built-in Single Sign-On Server (SSO) for easy access to all of the B/OSS applications. Reduce user management costs by out-of-the-box integration with LDAP and ActiveDirectory services. Secure your installation via a sophisticated system of roles, rights and security profiles. Run internationally with multiple language packs. Commercial: Linux, Windows 10, Windows 7, Windows 8, Windows Server 2012, 2016, Oracle Solaris, IBM AIX and HP-UX. Open source: Linux and Open Solaris. CPU: Dual-core running at 2 GHz. RAM: 1 GB of free, available RAM for NMS & APM, additional 1 GB when the database is running on the same host. Disk space: 1 GB for NMS & APM, additional 3 GB (4 GB total) when the database is running on the same host. Commercial: Oracle (version 10 or higher), Microsoft SQL Server (2008 or higher). Free: Oracle Express, Microsoft SQL Server Express. Please contact us for information on CPU, RAM and disk requirements for your installation. Desktop: Any web browser supporting Adobe Flash version 9 or higher including Internet Explorer, Firefox, Chrome, Opera, Safari and others. Please fill in the form below to schedule your personal IT Management Suite demo. Our consultant will contact you within one working day.